March 5, 2018 By Elizabeth Lindemann 4 Comments / This post may contain affiliate links. 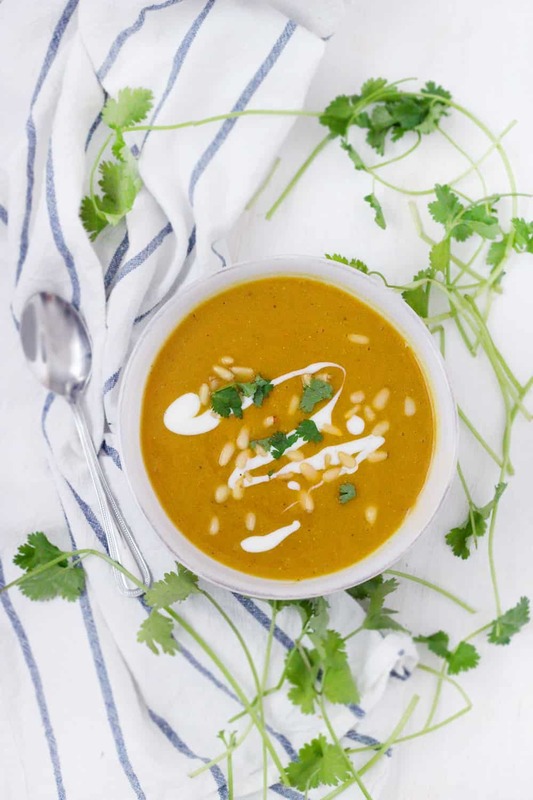 This Butternut Squash and Red Lentil Soup with Turmeric is the perfect healthy recipe you need in these last few weeks of cold weather. It’s packed with vitamins, fiber, protein, and immune-boosting properties. It’s delicious- slightly sweet from the squash, with a warm, peppery taste from the turmeric. And it’s so easy to make! At the risk of jinxing myself, my family and I have managed to avoid getting sick this winter. I’ve been a tightly wound ball of paranoia regarding the flu. With a 14-month-old daughter, and me being almost 8 months pregnant… ugh, I don’t even want to think about it! We’ve come this far into the flu season, and I’ll be damned if we go down without a fight. Which is why I created this soup. It has a big dose of orange vegetables (high in vitamin C), as well as turmeric (which has many immune-boosting qualities), and it’s hearty enough for a whole meal with the added protein from the red lentils. This recipe could not be easier to throw together. 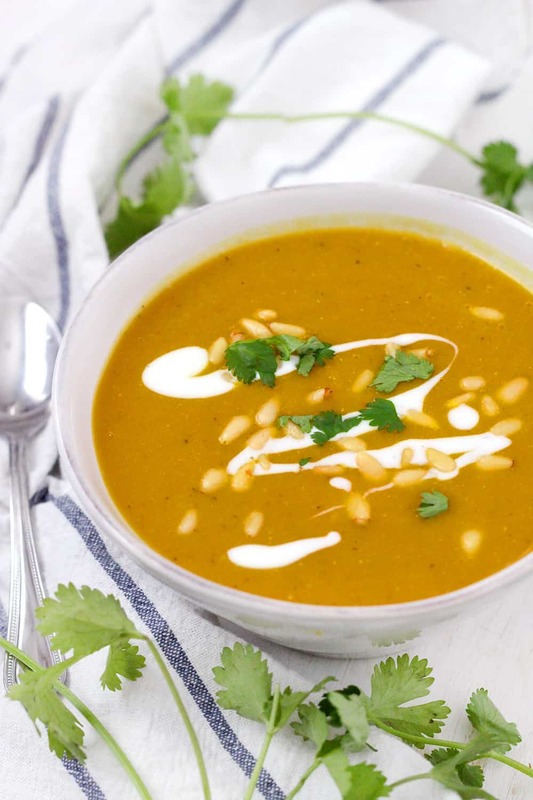 I garnished the soup with some pine nuts for added texture, as well as a drizzle of plain yogurt and garnish of fresh cilantro for a tangy, bright added flavor. My daughter gobbled it right up! I pureed the soup with an immersion blender for a velvety smooth texture, but you can use a standing blender if you don’t have one, or even a potato masher if you want more texture. I used homemade chicken stock, as I always have some on hand in my freezer, but you can use vegetable stock for a vegan/vegetarian version. This recipe is already super inexpensive to make, but for an even more budget-friendly recipe, use water- just add a bit more of the seasoning to make a richer taste. 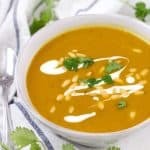 If you like this recipe, you’ll love this Ginger Turmeric Butternut Squash Soup. 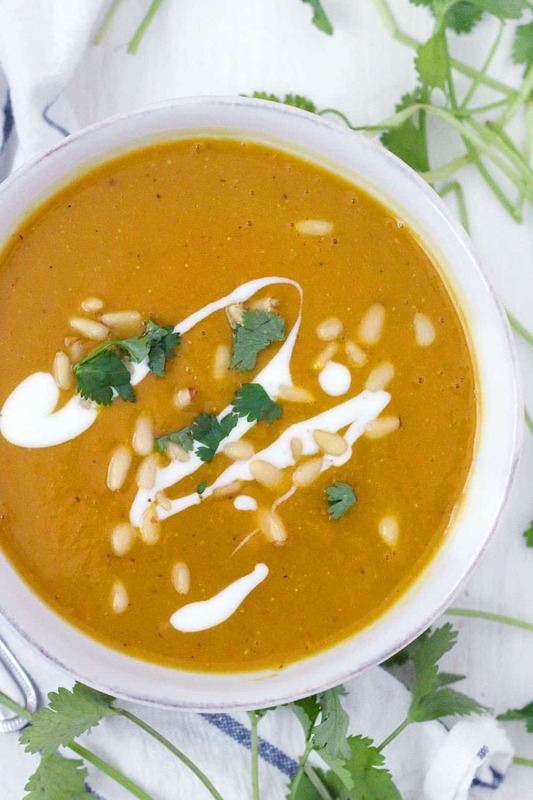 Here’s the printable recipe for Butternut Squash and Red Lentil Soup with Turmeric! This vegan, nutrient-packed Butternut Squash and Red Lentil Soup recipe is easy, delicious, and packed with fiber, protein, and vitamins. Turmeric adds a warm, peppery flavor as well as immune-boosting properties. In a large pot, sauté the onion in 1 tablespoon butter over medium high heat until softened and starting to brown (about 3 minutes). Add the cumin, turmeric, salt, and pepper. Stir, coating the onions in the spice mixture, until it becomes fragrant (about 1 minute). This will help the spices toast and become more flavorful. Add the broth and/or water, squash, and lentils. Stir, bring to a boil, cover, and simmer until squash is tender and lentils are fully cooked (15-20 minutes). Use an immersion blender to puree the soup directly in the pot until very smooth. Alternatively, you can use use a standing blender in batches to do this (or for a more rustic, textured soup, a potato masher will do just fine). Stir remaining butter into soup until melted. Taste and adjust seasoning if necessary. Serve garnished with plain yogurt, chopped fresh cilantro, and/or toasted pine nuts, if desired. To make this vegan, be sure to use vegetable stock and/or water, as well as olive oil instead of butter. This soup reheats and freezes well- make ahead of time and store in an airtight container in the refrigerator for up to 5 days or the freezer for up to 6 months. Butternut squash ripening in the garden! Delighted to find this recipe. Love red lentils and turmeric. A pot of your marinara is cooking right now, however, tweaked a bit, as needed. 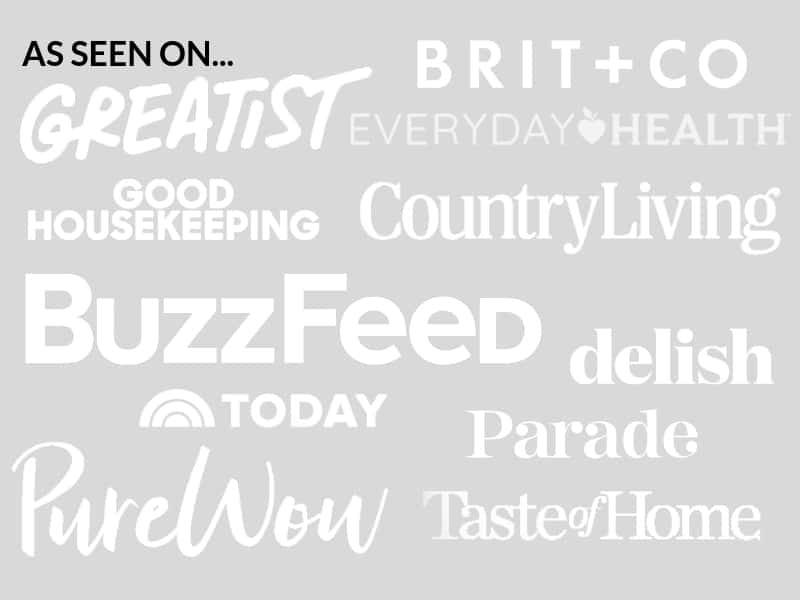 Enjoying the rest of your blog as it cooks. Wish I had butternut squash in my garden! I tried two years in a row but squash vine borers always get them. Hope you liked the marinara! This looks fantastic! Sometimes I find that I’m still a little hungry after having butternut squash soup, so I love that you added lentils for extra protein/staying power. Best wishes for a healthy rest of your pregnancy! Thanks!! That’s exactly why I added them- I didn’t want to still be hungry (although at this point in pregnancy that’s nigh impossible lol).